What is the mesoscale and how do we classify it? Why are non-hydrostatic processes so important to mesoscale meteorology? Why does forecasting mesoscale meteorology rely on model resolution? How might mesoscale processes impact fleet operations? Learning lots of awesome things. If you love to learn and love weather this is where to do it. Loved this course. It was easy to understand and was straight to the point. É relevante para o aprendizado de mesoescala. 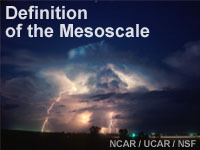 This introductory level course in mesoscale meteorology is very well put together, and is easily understandable. very good and informative lesson. A nice, basic introduction to the importance of smaller scale features affecting forecasting. Very good! but you should improve the data display, in order to make it more "user-friendly"
This Lesson helped me a lot to understand the Definition of the mesoscale. This was my very first course. It was fine, although it was hard to tell which content would be important for the quiz. Some answers to quiz questions seemed somewhat buried in the content. very helpful material to study with. Generally speaking the information is not summarized well and does not lend itself to a practical nature. This lesson, even when memorized, still makes itself very difficult to apply to test questions and vice versa. Would like to see better and more general explanations of the definitions in the lesson before any specifics are given. This was a very helpful introduction to the meaning of mesoscale and helps me to differentiate mesoscale from synoptic meteorology for a storm chaser like me. The quiz did not test understanding of the lesson, instead just tests whether specific elements could be remembered (one could even look it up). I would prefer the questions to be different (more abstract / not copied / case study). not designed well to retain so much information. Good overview for a beginner. Information is very easy to understand. However, the module is very basic and I would not recommend to experienced forecasters. For a beginner such as myself, this module was a solid introduction to Mesoscale definitions. The format and information is very easy to understand and the combination of terms and diagrams helps communicate terms and concepts successfully. I recommend this module for others. Terminal Objectives By the end of this module you should be able to do the following: 1. Identify and classify mesoscale weather phenomena 2. Identify the NWP model characteristics required to forecast different mesoscale weather phenomena. Enabling Objectives By the end of this module you will be able to do the following: 1. Recall the horizontal and time scales of mesoscale-alpha, mesoscale-beta, and mesoscale-gamma weather phenomena. 2. Given a list of weather phenomena, correctly classify them as either mesoscale-alpha, mesoscale -beta, or mesoscale -gamma 3. Describe hydrostatic balance. 4. Recall why non-hydrostatic processes are so important to mesoscale meteorology? 5. Recall the relationship between mesoscale and synoptic scale NWP models. 6. Describe the relationship between grid spacing and model resolution for NWP models. 7. Correctly estimate the NWP model resolution required to accurately simulate several mesoscale weather phenomena, including topographically forced weather, development of fog and low stratus, and development of convective storms. The original content of this module was rebuilt in a new format in October 2011. No changes were made to the content.